Product launch plans help you plot out development, distribution, and messaging for new products and features. As you approach your launch date, your product launch plan will keep you and your cross-functional partners aligned on the problem you're solving. 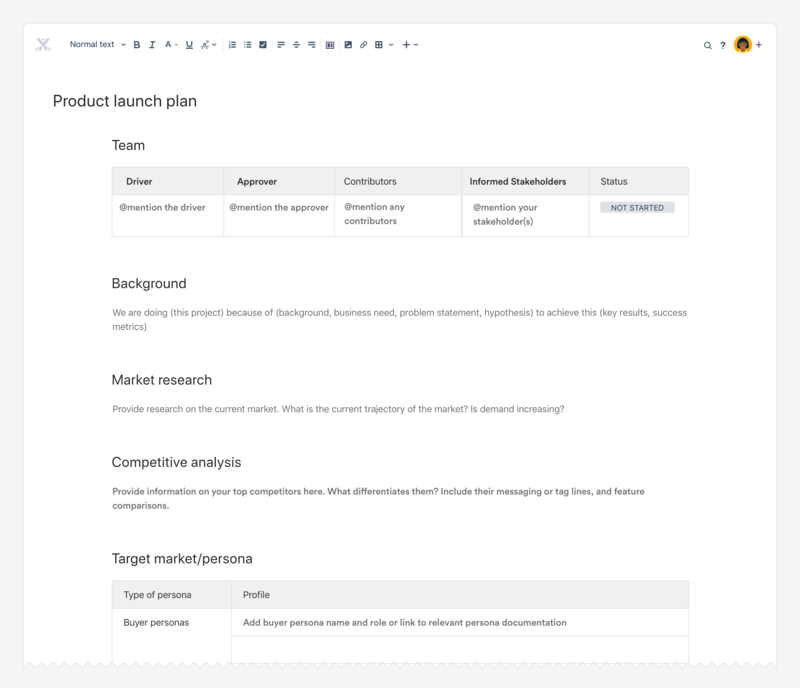 Use the product launch plan template in Confluence to keep track of everything you need to do to launch successfully and on schedule. Align on strategy, create a roadmap to track major milestones for design, engineering, and marketing, and determine how you'll judge success. The template even includes hints and tips that conveniently disappear when you start writing. Select Product launch plan, then tap Next. Tap Create and add info about your launch. Add as much information as you can to the product launch plan and highlight anything that needs discussion. After you've filled out the template to the best of your ability, host a quick project kick-off to review your plan with cross-functional partners and finalize your roadmap. Use your product launch plan to keep everyone focused on the problem at hand. Finalize pricing details with your finance team, add market research and support resources, and work with your marketing partners to decide how you'll message your product to customers. Use your support plan to guide interactions with customers. Once your product has been out for a few months, review your initial goals and compare performance along key metrics to judge the success of your product. Product launch plans are created from a blueprint template, which means they come bundled with Confluence and are available across your whole site. Blueprint templates can be customized for each space, and the site admin can even change the default blueprint template for your whole site. To learn more about customizing blueprint templates or creating your own templates, see Blueprints and user-created templates.